DreamHack is the worlds largest digital festival and holds the official world record as worlds largest LAN party in the Guinness Book of Records. DreamHack is focused on everything you can do with computers, Internet and digital entertainment and culture. DreamHack is a lot of gaming, communication, programming, designing, music composing and whatever you can imagine! DreamHack Summer 2013 continued the festivals reputation for breaking records. As well as holding the Guinness World Record for the worlds largest LAN party, Junes event achieved the most viewing hours per user ever, with over 10 million stream starts and 2.5 million unique viewers over the weekend across a range of channels including national broadcast, live performances and online content. The festivals technical team had to not only ensure that all of these audiences received the very best quality content, but also that the gaming and digital experience of those controlling the console was replicated as closely as possible for those viewing online or on television. Not an easy task, especially with eight productions being broadcast simultaneously for up to 18 hours a day for the four days of the festival. Eight purpose built flight packs were put together, with the three largest built around Blackmagics ATEM 2 M/E Production Switcher and ATEM 2 M/E Broadcast Panel.They also feature Blackmagics Compact Videohub for video routing, ATEM Studio Converter, Teranex 2D Processor, HyperDeck Studio Pro SSD broadcast deck and SmartView Duo for monitoring. Translating the immersive feel of a gaming battle or a programming demonstration from a small computer screen out to large screens for the events visitors, and then to take this to a broadcast audience is a huge challenge, explains Jonas Bengtson, technical director for DreamHack. Youre dealing with a huge variety of feeds from different consoles, which need to be brought up to broadcast quality standard. But its not just a technical execution. Normally events such as sports would sell the rights to an event and hand everything over to the broadcasting partner. But gaming has its own distinct feel and you need people that understand this to be creating the content for broadcasters. A good example of this is ensuring image processing is set up to best match the onscreen experience. When gaming content is compressed and transmitted to broadcast, you lose a lot of black, and while humans are very good at distinguishing signal from noise, H.264 encoders are not, Bengtson continues. The Teranex units noise reduction solved a lot of our problems and made it possible for our viewers to get a much better picture over the streaming platforms on a lower bit rate. We used the Teranex to correct the black, saturation and balance to fix the colour levels. Weve come to view the Teranex as a fantastic problem solver for any image processing challenge. Our crew was impressed by the difference in quality it offers, particularly when dealing with the large amount of live feeds with little time to ensure youre producing the very best experience for viewers. We were able to handle HDMI, SDI and even compositefeeds from retro consoles, and upgrade these to HD without any loss of the true gaming experience. So whether you were watching on a screen at the side of the stage, on television or via DreamHack TV, the experience was as close as possible to actually holding the controller yourself. 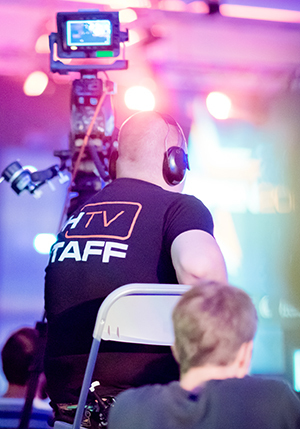 The flexibility and access of the workflow defined at DreamHack Summer will be the foundation for broadcast at the festivals future events. The set up with Blackmagic products gives us endless possibilities, without having to sacrifice quality. It is flexible enough to enable stage managers to stream different sources from screens in front of teams, and assign different feeds directly from the stage - meaning visitors and viewers are as close to the action as they possibly can be.